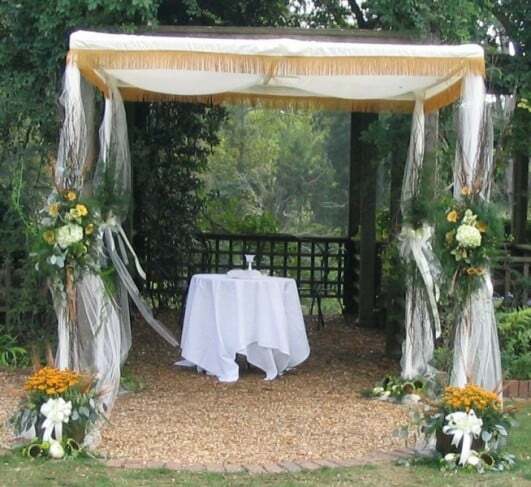 Our Chuppah has an ecru satin top with gold fringing, is supported by white poly poles, measures 7′ x 7′ x 7′, and easily breaks down and sets up for easy transportation. SKU: PAG07. Categories: Miscellaneous Wedding, Party & Event, Wedding. Tags: chuppah, wedding canopy. This flower urn comes in 2 different styles. Flowers are not included. These columns are 34″ tall and have a nice flat pedestal top for displaying a variety of items. Wicker flower stands are also available in 30″ and 42″ heights.